Dog urine accidents can happen in your home, that’s the unfortunate truth. You may have left your dog by itself for only a couple hours or maybe he accidentally due to some uncontrollable circumstance couldn’t hold his bladder due to overexcitement, fear, improper house training, or even a medical condition, the reality is accidents happen. Dog urine especially has a way of embedding its odor into the very surface contaminated, thus making the removal of dog urine odor a hard task to accomplish. Time and time again, people have a struggle completely eliminating dog urine odor from their home, as the smell can travel throughout their home making its way into the air and causing an unpleasant odor. The list is exhaustive of possible ways on how you can remove dog urine odor from your home from natural home remedies, claimed “miracle” products and even a variety of odor-eliminating products. But what really works? 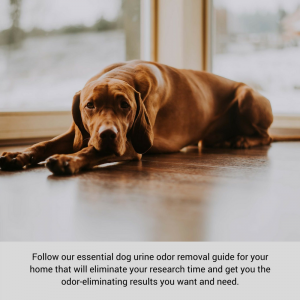 Rather than going through the list of potential or likely dog urine odor removal products and processes, instead, follow our essential dog urine odor removal guide for your home that will eliminate your research time and get you the odor-eliminating results you want and need. Exploring Home Remedies – Does Vinegar Work to Remove Urine Odors? Pet urine is an amalgam of ammonia, bacteria, hormones, nitrogen and uric acid all of which make up the concentration of urine. 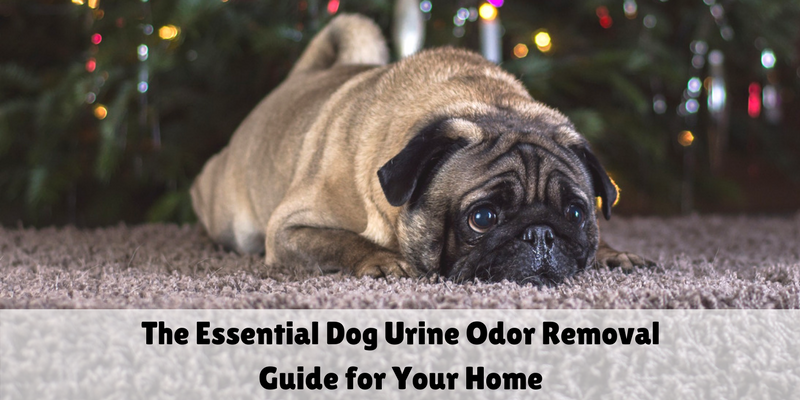 The underlying smell of dog urine is the uric acid which gives urine its lingering smell that most of us want to remove completely from our home. Many people will turn to home remedies such as using vinegar on the contaminated area to remove this smell from their home. The real question then becomes, does vinegar work to completely remove the odor? Vinegar is a quick-fix option to expelling urine odor, it works at alleviating the odor with its strong overwhelming smell that will take over the dog urine odor. This is due to vinegars high acidic concentration that helps to neutralize the scent but it isn’t effective on all odors and stains, which is something to keep in mind when deciding to use this home remedy. Time. Time is the most important and critical factor in the process of neutralizing dog urine. Dog urine, when allowed time to sit, will absorb into the surface of the floor or fabric and leave a lasting odor in your home. And sometimes it can take time to even find and locate the urine as your pet can have an accident in the most unsuspecting of places that you most likely will not find until your nose leads you to the scene of the crime. When you locate the accident, it is important to have a solution at the ready to implement to combat the urine odors that have been elicited in the surface of your home whether it be on a couch, carpeting or even wood floors. The OdorKlenz Pet Urine Eliminator product is a solution that is both safe to use around you and your pet as well as is versatile on multiple surfaces. OdorKlenz uses a natural earth mineral technology that works to neutralize the odor at the source with no added fragrances or masking agents. The OdorKlenz Pet Urine Eliminator is your one-stop dog urine neutralizer that you can easily apply to any urine odor on any surface. Carpet is like a sponge, absorbing liquids into the sub-floor of the carpeting which can make for a difficult pursuit in eliminating the odors completely. Thus, when you are dealing with a dog urine accident on your carpet, it too can get absorbed into the deep sub-floor of your carpeting. Applying the OdorKlenz Pet Urine Eliminator quickly to the infected spot can work to get down into the bottom of your carpeting to expel the odors trapped in the bottom. You first want to apply water to the accident area with a wet towel, make sure to use clean, warm water. Rinse the towel and soak up any extra liquid in the area leaving it damp. Simply pour the OdorKlenz Pet Urine Eliminator to the area and work it in gently in the carpet. Again, apply warm, clean water to the area and apply pressure by walking on the area or standing on it to allow the product to get into the deep underlying of the carpet. Leave it for 10 minutes, then come back with a towel to dry the surface. This easy application is how you can easily remove urine smell from your carpet. You can also apply this same method to removing dog pee on wood floors as well. Your dog, just like humans can have accidents. Being prepared for the next time your dog experiences an accident in your home can not only eliminate odors in your home but ensure that your dog won’t return to the scene of the accident again! 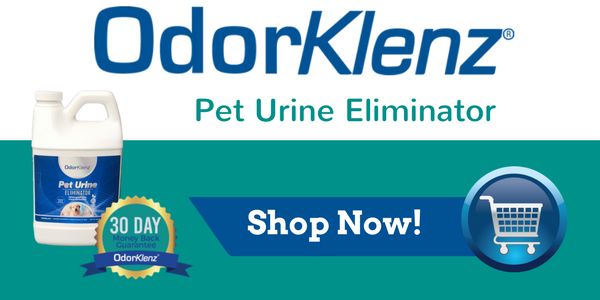 The OdorKlenz Pet Urine Eliminator is a safe and effective urine and pet odor removal solution. It works on a variety of sources from carpeting, wood, tile, and any water-safe surface. It is perfect to use while puppy training your new dog or even when your old dog has the occasional accident. Safe and Nontoxic, Perfect for Use Around Pets! We are confident that our OdorKlenz Technology will drastically reduce the odors in your home, if it doesn’t live up to your expectations, we will issue a full refund within 30 days of your purchase! Click below to buy TODAY!